On the road which passes the shrine of Our Lady of the Thorn high up in the Jura Mountains, there is the shrine of Our Lady of Puy. 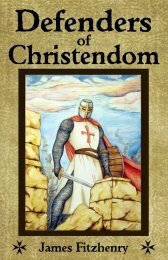 All crusaders passed this on their way to the Holy Land on pilgrimage to rescue the Holy Places from the hands of the infidel. There was scarcely a knight who did not go to bid farewell to Our Lady of Puy and ask her to care for his dear ones, should he not return. Close to this shrine lived a wealthy nobleman, lord of a beautiful, spacious castle in the gorge, who offered hospitality to all while they made their devotions to the Mother of God and entrusted themselves body and soul to the Gracious Virgin Mary. Le Puy claims to be the location of the earliest vision of the Blessed Virgin after her death when she appeared to a sick woman in the first century A.D. It happened in this way. In about the year 46 Saint Peter sent missionaries into a land that was then known as Gaul (modern day France). Saint George of Velay was the first Bishop of that See. In about the year 70 there was a widow from Ruessium named Villa who was a new convert and became sick with a high fever. Villa prayed to the Blessed Virgin for a cure, and Mary appeared to her, asking Villa to climb Mount Anis to be healed. Villa, believing in the apparition, had her servant carry her to the place indicated. When they reached the spot, the servant set Villa down to rest upon a large rock. Villa fell asleep, and when she awoke she found she was completely cured. As the woman had slept, she saw, in a dream, a celestial female, whose dazzling robes floated like a white mist, and whose head was encircled by a crown of precious stones; this woman, of exquisite beauty, was surrounded by a retinue of angelic spirits. "Who," inquired the daughter of the Gauls of one of the blessed spirits, "who is that queen so gracious, so noble, and so beautiful, who comes to me, a poor, sick woman, in my extreme affliction?" "It is the Mother of God," replied the angel; "she has made choice of this rock to be invoked here, and she charges you to inform her servant George of it. That you may not take the order of Heaven for a vain dream, arise, woman, you are healed." When she awoke, the woman had, in fact, no more languor or fever. Filled with gratitude, she lost no time in running to the bishop, and relating to him with her own mouth the message of the angel. It seems that the Mother of God desired that a church eventually be built there, for when Villa told Bishop George of her miraculous cure, he climbed the mount himself with some of the clergy to see the place. Arriving at the very spot, Saint George was startled to come upon an impossible sight. Even though it was the middle of summer, the peak of Mount Anis was inexplicably covered in snow. Then, as they marveled, a stag came from out of a thicket and stood before them, marking with his careful steps the outline of the rock upon which Villa had recently been cured. Saint George had a fence built around that rock to preserve the place, but it was not until a much later date that the spot became the location of a new church altar. It wasn’t until the year 221, well over a century later, when the Blessed Virgin, accompanied by angels, appeared to a paralyzed woman who besought her assistance through ardent prayer. Mary told the woman to ascend Mount Anis, which she immediately did. 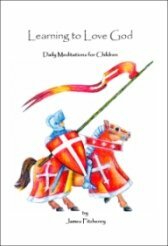 Upon reaching the fence Saint George had erected there, the woman was instantly cured. The Mother of God appeared to the woman now to request that a church be built in her honor upon that holy ground. Pope Callistus I gave permission for the church to be constructed, and it was Saint Martial who built the church. He left there a priceless relic – one of the sandals of the Blessed Virgin Mary. When the church was completely finished the bishop went to Rome to request a solemn consecration for the church. He had not gotten far when he ran into two dignified old men, each of whom carried a gilded chest. They said the chests held precious relics brought all the way from Rome to be deposited at the new church at Mount Anis, and then told the bishop that heavenly angels had already consecrated the church. Saying so, the pair disappeared. The location became a popular site for pilgrims on the route to Santiago de Compostella in Spain, and there was no place in France more frequented. Some of pilgrims who visited Puy include Saint Anthony of Padua, Saint Dominic, and Saint Vincent Ferrer, among many others. The Emperor Charlemagne visited the church in the years 772 and 800, and selected it as one of the locations for the gathering of alms to support the Pope, which monies became known as “Peter’s Pence.” The list of holy and great men who came as pilgrims is as impressive as the numbers of ordinary people. 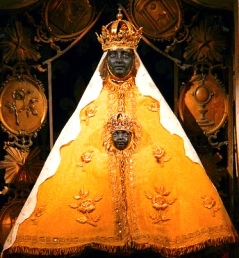 Pope Saint Leo IX declared that the Mother of God is nowhere given a more special and filial veneration, and that Notre Dame of Puy was the most illustrious shrine in France. The Bishop Adhemar de Montheil, living at Puy, was said to be the first person to take up the Crusader’s Cross when Pope Urban II was preaching and encouraging the first Crusade. Acting as the Legate of the Holy See, this bishop went with the famous knight Godfrey de Bouillion on his journey to the Holy Land. Pope Urban II prayed for the success of the crusade at the church of Notre Dame de Puy on the Feast of the Assumption in the year 1095. Shortly before he left, the Bishop Adhemar de Montheil also prayed there for the liberation of the Holy Land, when overcome by a sudden inspiration rose and gave voice to a beautiful new prayer to the Blessed Virgin Mary, singing - “Salve Regina, Mater Misericordiae, vita, dulcedo et spes nostra, salve!” or “Hail, holy Queen, Mother of mercy, hail our life, our sweetness, and our hope!” This prayer used to be known as the Anthem of Puy, and was a much beloved prayer of the knights on the First Crusade addressed to Our Lady in heaven. 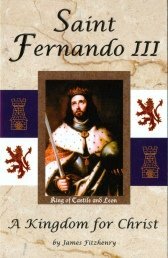 King Louis IX of France met with the King of Aragon at Puy in the year 1245, and in 1254 Saint Louis gifted the cathedral with an ebony image of Mary. The King had brought the statue back from the Holy Land, where it was known to be a statue of great antiquity. It featured the Blessed Virgin seated upon a throne and holding the Infant Jesus on her lap. In the coming years this statue was carried in procession to implore the intervention of the Blessed Virgin Mary during times of hunger, war or pestilence. The statue survived all throughout the Middle Ages, though the original image was burned by atheistic revolutionaries in 1793 during the French Revolution. The one currently on display is a copy of the original. Le Puy observes a privileged jubilee or holy year whenever Good Friday falls on the feast of the Annunciation; this does not happen often – the last time was in 1932, and the next time will be after the year 2000. 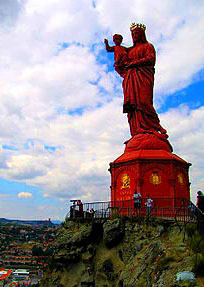 In 1860 a large statue of Our Lady of France was blessed at Le Puy; it is made of the metal of over two hundred pieces of artillery, captured by the French at Sevastopol in the Crimean War. It is about 16 meters tall and weighs about 10 tons. Before the rise of Lourdes, Le Puy, Chartres, and Liesse were the greatest Marian centers of France. When the consecration of the shrine of Puy was to take place, it was made known to the Bishop that it had been consecrated by angels; the doors opened of themselves; the bells rang of themselves; the candles were found lighted and the Holy Chrism which the angels had used was found still fresh upon the altars and the walls. Although Saint George was its first Bishop and had marked out the site of the church, the church was not built until the year 221. Mary herself gave the charge of it to Saint Evodius, Bishop of Vosi, who was ordered by Our Lady to transfer his Episcopal see to Puy.